Brad Pitt’s new movie The Lost City of Z, which stars Sienna Millar, Robert Pattinson and Charlie Hunnam, has started filming outside Ballygally. 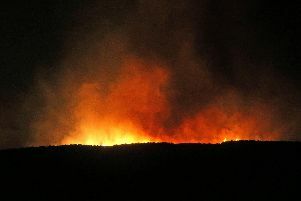 The Times captured exclusive pictures of fires being lit at the set and vans for the cast and crew, while Ballygally residents revealed that extras have told them they have been digging trenches in preparation for the shoot. The local area is fast becoming a popular filming location.